Do you live in West Palm Beach? West Palm Beach is a city in and the county seat of Palm Beach County,Florida, United States. It is one of the three main cities in South Florida. The population was 99,919 at the 2010 census. The University of Florida Bureau of Economic and Business Research (BEBR) estimates a 2014 population of 104,031, a 4.1% increase from 2010. It is the oldest municipality in the South Florida metropolitan area, having been incorporated as a city two years before Miami in November 1894. 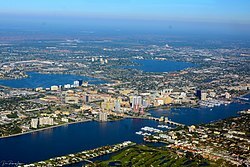 West Palm Beach is located approximately 68 miles (109 km) north of Downtown Miami. The beginning of the historic period in south Florida is marked by Juan Ponce de León’s first contact with native people in 1513. Europeans found a thriving native population, which they categorized into separate tribes: the Mayaimi in the Lake Okeechobee Basin and the Jaega and Ais peoplein the East Okeechobee area and on the east coast north of the Tequesta. When the Spanish arrived, there were perhaps about 20,000 Native Americans in south Florida. By 1763, when the English gained control of Florida, the native peoples had all but been wiped out through war, enslavement, or European diseases. Other native peoples from Alabama and Georgia moved into Florida in the early 18th century. They were of varied ancestry, but Europeans called them all “Creeks.” In Florida, they were known as the Seminole andMiccosukee Indians. The Seminoles clashed with American settlers over land and over escaped slaves who found refuge among them. They resisted the government’s efforts to move them to the Indian Territory west of the Mississippi. Between 1818 and 1858, three wars were fought between Seminoles and the United States government. By 1858 there were very few Seminoles remaining in Florida. The area that was to become West Palm Beach was settled in the late 1870s and 1880s by a few hundred settlers who called the vicinity "Lake Worth Country." These settlers were a diverse community from different parts of the United States and the world. They included founding families such at the Potters and the Lainharts, who would go on to become leading members of the business community in the fledgling city. The first white settlers in Palm Beach County lived around Lake Worth, then an enclosed freshwater lake, named for Colonel William Jenkins Worth, who had fought in the Second Seminole War in Florida in 1842. Most settlers engaged in the growing of tropical fruits and vegetables for shipment the north via Lake Worth and the Indian River. By 1890, the U.S. Census counted over 200 people settled along Lake Worth in the vicinity of what would become West Palm Beach. The area at this time also boasted a hotel, the "Cocoanut House", a church, and a post office. The city was platted by Henry Flagler as a community to house the servants working in the two grand hotels on the neighboring island of Palm Beach, across Lake Worth in 1893, coinciding with the arrival of the Florida East Coast railroad. Flagler paid two area settlers, Captain Porter and Louie Hillhouse, a combined sum of $45,000 for the original townsite, stretching from Clear Lake to Lake Worth. On November 5, 1894, 78 people met at the "Calaboose" (the first jail and police station located at Clematis St. and Poinsettia, now Dixie Hwy.) and passed the motion to incorporate the Town of West Palm Beach in what was then Dade County (now Miami-Dade County). This made West Palm Beach the first incorporatedmunicipality in Dade County and in South Florida. The town council quickly addressed the building codes and the tents and shanties were replaced by brick, brick veneer, and stone buildings. The city grew steadily during the 1890s and the first two decades of the 20th century, most residents were engaged in the tourist industry and related services or winter vegetable market and tropical fruit trade. In 1909, Palm Beach County was formed by the Florida State Legislature and West Palm Beach became the county seat. In 1916, a new neo-classical courthouse was opened, which has been painstainkingly restored back to its original condition, and is now used as the local history museum. In the 1960s, Palm Beach County's first enclosed shopping mall, the Palm Beach Mall, and an indoor arena were completed. These projects led to a brief revival for the city, but in the 1970s and 1980s crime continued to be a serious issue and urban sprawl continued to drain resources and business away from the old downtown area. By the early 1990s there were very high vacancy rates downtown, and serious levels of urban blight. Since the 1990s, developments such as CityPlace and the preservation and renovation of 1920s architecture in the nightlife hub of Clematis Street have seen a downtown resurgence in the entertainment and shopping district. The city has also placed emphasis on neighborhood development and revitalization, in neighborhood districts such as Northwood Village, Old Northwood, Flamingo Park and El Cid. Many neighborhoods still struggle with urban blight and crime, as well as lowered property values caused by the Great Recession, which hit the city particularly hard. The latest large scale development within the city is the re-development of the mostly abandoned 1,000,000 + square foot Palm Beach Mall, located at the Interstate 95/Palm Beach Lakes Boulevard interchange. Ironically, the very mall that initiated the original abandonment of the downtown, is itself now abandoned and considered by many an eyesore. Re-development of the mall into the Palm Beach Fashion Outlets has begun as of late 2012. The building of the outlet mall has been finished since February 2014. According to the United States Census Bureau, this city has a total area of 58.2 square miles (151 km2). 55.1 square miles (143 km2) of it is land and 3.1 square miles (8.0 km2) of it (5.26%) is water. Cruise Transportation: Celebration Cruise Line provides two-night roundtrip Bahamas cruises and one-way cruise transportation between Palm Beach and Grand Bahama Island (Freeport). Celebration's Bahamas Celebration sails every other day out of the Port of Palm Beach. Air: The city is served by Palm Beach International Airport, located in unincorporated Palm Beach County. The airport attracts people from all over the county as well as from the Treasure Coast and Space Coast counties to the north. In 2006 there were 6,824,789 passengers who passed through the gates of PBIA making it the 58th busiest airport in the nation. Rail: Tri-Rail commuter rail system serves the city from a historical station located on the west side of Tamarind Avenue, just east of I-95. Tri-Rail provides commuter rides north to Mangonia Park and south to Miami. Amtrak has daily trains arriving and departing to points north. CSX Transportation and the Florida East Coast Railway also serve the city.